Quentin Franks Racing is 940+ Points Profit, Since July 2014. That’s £9,400+ Clear Profit, Betting Just £10 Per Point. We think this is the most consistent results graph in UK racing right now. Would you agree? 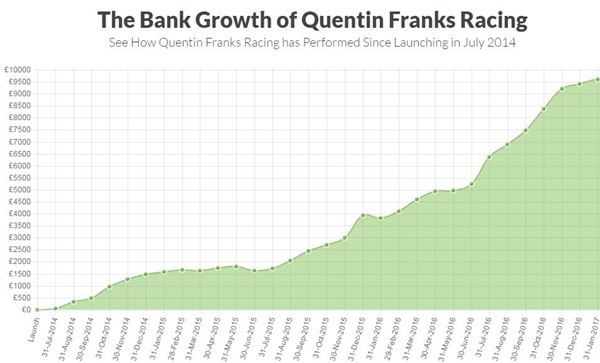 Quentin Franks Racing has emerged as the current most-successful UK racing tips subscription service, on the industry’s biggest pro-tipster network Betting Gods. Behind this service is a man who can hand pick winning bets on the at a rate of 24.77%! Yes, you read that right, a strike rate of 24.77% which has gone onto produce an average monthly profit of over £300 (£10 Stakes) and a total profit since 1st July 2014 of over £9,000 (£10 stakes). All previous tips have been proofed and can be viewed from July 2014, on his Google Docs spreadsheet which can be found on his website here. 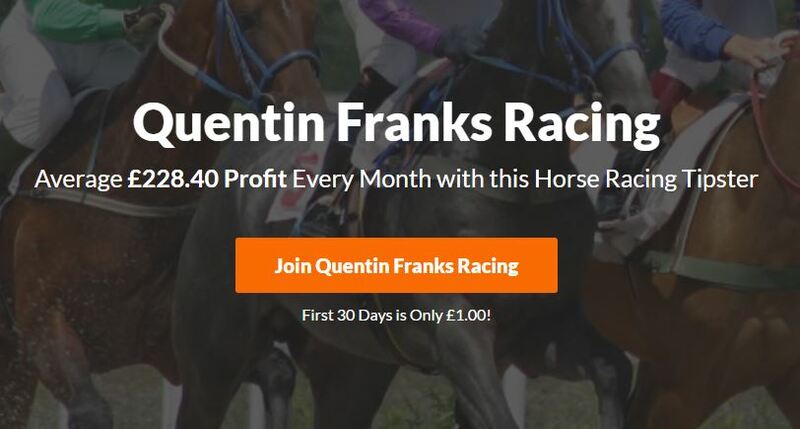 If you are looking for a tipster service, which will inform you ahead of the best bets to secure a long-term consistent profit, then Quentin Franks Racing is the ideal service for you. It’ll fully prepare you for the day ahead with up to two emails each morning, advising you on the best horse racing bets of the day. It goes one step ahead of other tipsters and you’ll receive clear and coherent, up-to-the-minute staking advice and tips on the bookies with the best available odds for the chosen races. Quentin Franks Racing also offers occasional special tips with ante-post bets and festival selections sent directly to you via email. With decades of experience in earning profits as a horse racing bettor, Quentin Franks offers daily insights into the though process of one of the best and most successful tipsters around. By utilising Quentin Franks’ years of experience and knowledge of the Horse Race betting scene, you can earn profits on your racing bets on a regular basis. Click here to grab the 30-day trial, for just £1! You’ll get the full subscription service for a whole month (usually £39.95, or £99.95 per quarter). Do you want to place back bets on the horse racing that win at a rate of 24%? Then join up today as you certainly won’t be disappointed. PS, with Quentin Franks Racing you are backed by Clickbank’s 60 day money back guarantee. If you’re unhappy with the service then you’re guaranteed a full refund. No questions asked! Yes. You will always be advised which odds to take. Do I Need a Betfair Account? No. You will be betting with Best Odds Guaranteed bookmakers. It is recommended that you have a starting bank of 100pts when following this service. While Quentin Franks has never experienced anything close to a 100pt negative swing, he takes a conservative approach to bankroll management. When are the Selections Sent? Selections are emailed Monday to Sunday From 9.00am. What Type of Bets are Provided? This service provides its members with win bets. With this service, you have the option of joining monthly at £39.95 or quarterly at £99.95. Only bet with an amount of money you can afford to bet with. Then take this money and divide it by the recommended starting bank provided to you by the tipster, in this case 100pts to calculate the value of a 1pt bet. For these selections, bets are advised at 1 – 5pt stakes. There are an average of 70-90 selections every month. Yes. If you are unhappy with the service then you have up to 60 days to claim a no questions asked refund. You can pay for the 30 day trial with either Paypal, Visa, Mastercard or Maestro. If you choose to take up a full subscription, you can pay the monthly fee in the same way. Won’t the bookie ban me if I start winning, or limit my bet-size to less than a pound? The major bookmakers don’t care about a small percentage of their customers finding a bit of value, when the early-bird prices are available. The early betting is essential to helping them firm-up their markets. That enables them to be ready for when the serious betting starts, shortly before each race. What really concerns bookmakers is arbitrage betting – bettors who consistently make bets when the bookie is offering a slightly better price than the exchanges (Betfair). The bookmaker can easily spot punters who are doing this and will quickly limit/close the account. If they did not do this, then they simply wouldn’t survive. Forget about arbitrage betting. It is completely dead in the water. Getting bets of £10-50 on, with major bookies, should not be a problem if you don’t make arbitrage bets. Of course, occasionally you will make a bet at what may be considered an arbitrage price without meaning to. The bookies know this is going to happen now and again. It is consistent arbitrage betting that they don’t like. Arbitrage spots are rare and are usually only available for a few seconds. Just bet as you are advised and you’ll be fine. No! Being a winning professional bettor requires discipline and most gamblers simply don’t have any. If you only bet on Quentin Franks’ tips, at the advised odds, then you will win money. Be honest with yourself though? Can you trust yourself to do this? Many people can’t, as they enjoy betting on every race and can’t resist having a punt even if the advised odds are no longer available. If you don’t think you have the discipline, to bet strictly as advised, then it’s best not to bother signing-up. There is nothing wrong with being just a recreational punter, so long as you keep your bets small. If you are only betting 50p a race and enjoy watching the action, then that’s reasonably good value for money as far as entertainment goes. Every few weeks, you’ll just need to make a small deposit to your bookmaker and you can carry on having fun. The horses recommended in Templegate’s daily racing preview (below) can all be expected to run a competitive race. On some days, you can back all of them at SP and make a profit. EveryTip will always offer plenty of good free tips, for the recreational punter. Tips that are proven to make money, over a significant sample-size require a small investment though. At the end of the day, it’s up to you. If you want to become a winning punter, click here to grab the 30-day trial, for just £1 and start to see the difference. If you are happy to remain a recreational bettor, today’s free tips will set you up for the day!